Contoh Review Text (Film) - Setelah mendapatkan penjelasan mengenai apa itu Review Text, pada kesempatan kali ini penulis hadirkan dua Contoh Review Text tantang film. Sebagaimana kita ketahui sebelumnya, Review Text tidak semata-mata digunakan hanya untuk me-review film saja, tapi juga bisa digunakan untuk me-review buku, barang, karya seni, dll. Mungkin pada kesempatan yang akan datang, penulis akan hadirkan Contoh Review Text yang lainnya. 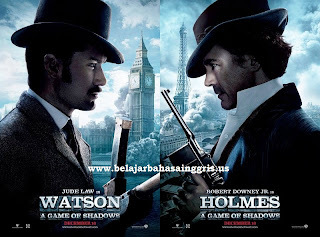 Dua film yang penulis review kali ini adalah dua film kesukaannya tahun ini, Sherlock Holmes 2 dan Battleship. Pernah menontonnya? Bagi yang pernah menonton kedua film tersebut, pasti memiliki pendapat yang sama bahwa kedua film tersebut sangat keren. Untuk itu, penulis berusaha menjadikan kedua film tersebut sebagai Contoh Review Text tentang film. Detective Sherlock Holmes and his friend Dr. Watson back on the cinema through the 'A Game of Shadows'. After the success of his first film in 2009, Guy Ritchie re-directed sequel of 'Sherlock Holmes'. A bomb exploded in Strassbourg, England soon became headlines in several newspapers. Holmes (Robert Downey Jr.) who disguised as a beggar was busy stalking Irene Adler (Rachel McAdams), his enemy which also his idol that brings an important package. In the sequel of 'Sherlock Holmes' this time, Professor. James Moriarty (Jared Harris) to be the most dangerous enemy. Moriarty is not the kind of people who are hesitant to remove the lives of many people in order to achieve the goal. Explosions in Strassbourg is one of the results of Prof. Moriarty's creation. Holmes nosy busy when his friend, Dr. Watson (Jude Law) is getting married, because marriage would automatically make Holmes lost his partner in investigating the case. A gypsy woman, Madam Sinza Heron (Noomi Rapace), helped Holmes the adventure this time. There was also the Holmes brother, Mycroft Holmes (Stephen Fry) who come to be an accomplice of the detective this time. Arguably, the visual effect of 'A Game of Shadow' is more stable than its predecessor. A few slow-movement scenes later find in the cease-fire. Colors are displayed also feels right. Farce as those made by Holmes and several other characters in the film guaranteed to invite laughter. The chemistry between Robert Downey Jr. and Jude Law is not be doubted anymore. Since in the first film, the two men are able to captivate the audience and not be missed. Chess compete between Holmes and Prof. Moriarty became the ultimate point. They both described the mind wanders respectively. Do you intrigued with the acting of the detective? The film 'Sherlock Holmes: A Game of Shadows' can be an alternative entertainment at this weekend. The world's largest toy manufacturers from the United States, Hasbro, re-create the movie-themed games. If you previously relied-figure display Transformers sequel trilogy to be made-this time they put the war's most famous board game, Battleship. The story begins with NASA since 2005 to try to make contact with the outside world. Various ways they are doing to meet the "other friend" of humans. In other places, there was the story of Hopper brothers. 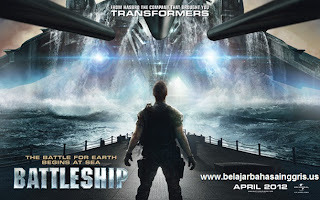 His brother, Stone Hopper (Alexander Skarsgrad), commander of the U.S. Navy, forcing her brutal brother, Alex Hopper (Taylor Kitsch), entered Navy for having "ruined his life" with teasing Sam (Brooklyn Decker), the son of Admiral Shane (Liam Neeson ). Credibility Alex tested when 14 states conduct exhibitions RIMPAC war games in Hawaii, USA. Alex had clashed with Captain Nagata (Tadanobu Asano) when Nagata kicked his face in a football tournament RIMPAC. This incident brought up when they meet again in the bathroom and clashing fist. Admiral Shane was very disappointed with Alex that it threatens to fire him. Amid the exhibition, there are five unexpected alien ship glides to Earth, one devastated Hong Kong. The other was stranded in the middle of the ocean Hawaii. 'John Paul Jones' ship, who commandeered Alex and two other battleship, approached the foreign ships and the three ships trapped in an artificial electromagnetic fields of that foreign ships. This is where the battle occurred. Powerless looking man against sophisticated "alien" ships. Hope feels thin for young people to live. Are people going to survive? More details please watch the movie. Characterizations in the film is pretty good. Taylor Kitsch portrayed the bumbling leaders well, as he does in the movie Star Trek (2009). Assisted by some famous stars, such as Rihanna, who plays Cora Raikes, and Gregory D. Gadson as Colonel Mick Canales, Taylor makes this film interesting with some tense scenes and his unpredictable. Unfortunately, the plot is not too special, like a regular movie war strategy. But, with piggyback famous trademarks and well-known movie actor (swimsuit models Brooklyn Decker is known in the U.S.), the film is arguably packaged quite nicely. It's quite worth being watched if you want a fancy full-scene of action-movie strategy.